When I saw the blurb of this book I knew I had to get my hands on it! I have read the entire Tales of Terror series and loved them so I was excited to read what else Priestley has to offer us… I have to say that while it was completely different to any of the Tales of Terror, it was absolutely fantastic! The story is of a 15 year old boy who stumbles across Frankenstein’s monster, ie Mister Creecher. It’s not exactly a retelling of Frankenstein but more an added extra to the original story, especially aided with the appearance of the original texts’ author, which amused me greatly! The help that Mister Creecher enlists from Billy means that Billy has to track down and follow Frankenstien… this takes the pair across London and beyond and the the story follows the time they spend together brilliantly. At first I couldn’t actually remember what happened in Frankenstein, I know I’m bad but it was like two years ago when I read it, so I didn’t know if the story was the same as the original or not… I now believe that the original has Frankenstein travel England believing he is being followed by the creature and this is what Priestley has used for his story. The references to the original story are all right, which I loved because it honestly felt this was a companion to the original. The story was really brought to life through the characters. Billy reminded me of those characters you meet in the classics like Oliver Twist and Great Expectations. I thought he was an incredibly strong character considering what he had been through and during their journey I saw him growinto a young man right before my eyes. I would have loved for everything to go right for him and get his own fortune somehow, even though he was just an urchin boy really. Billy chracters end surprised me greatly but as the book is mainly about him I cant really go into detail with that… all I will say is that I loved how it all fitted together. I remember feeling a bit sorry for the creature in Shelley’s Frankenstein when I read it and I loved how Priestley has obviously picked that up and gone with it for Mister Creecher… You really get to know the creature as a person rather than a thing and learn to treat the two characters like theyre brothers. Priestley took the intellect and everything that Shelley created and made it more humane and I loved every part of that! Having read a few others of Preistley’s books I had assumed this one was in the same 9-12 age range. I even suggested to the 11 yr old that he might like to read it… but my one downside was that the writing did seem a little too complex for this age range… maybe I got it wrong and its more teen aimed but I think the 11yr old would probably give it a go and discard after a few chapters as its above his usual reading level. I loved the writing style and will continue to read Priestley’s work because I think the way he brings a story to life is fantastic but I do think this ones for a slightly older audience. 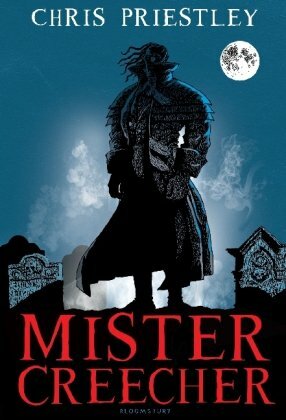 All in all Mister Creecher was a fun tale of Frankenstein from a different point of view with added bits. I enjoyed the story and the characters very much. The bond that is created between the two main characters really comes alive and I can’t help but see them as best friends, almost like brothers in fact. I think it is a brilliant addition to Frankenstein which picks up a point from the original story, brings that to life and drops it off at another point for the overall story to carry on! Mister Creecher will be published on 3rd October by Bloomsbury. My copy was kindly sent by the publishers in exchange for an honest review. Another Frankestein book! I do love them. I will look out for this one. I just stopped by for a late visit to the undead blog tour and spotted this review. I just finished and reviewed this myself a couple days ago to and I really enjoyed it, I immediately got Frankenstein on my kindle (for free!) cuz it made me so curious, and yes I want to read the other one to, I lived that ending, I didn’t see it coming at all, so clever!